Marvel have announced two new series by popular creators during their Mondo Marvel panel at San Diego Comic-con. Superstar writer Mark Waid is writing "Captain America: Man Out of Time" with an unannounced artist and featuring a variant cover by fan-favorite Art Adams. Waid achieved a well-received run on Cap in the '90s, and now he's back in a five-issue miniseries that explores what happened right after Captain America was unfrozen by the Avengers. This series will, as the title suggests, explore the stresses of waking up decades after everyone you've ever known has passed away and at a point in time when the most important event of your life has been reduced to mere myth and entertainment for children. "It's sort of a Year One story for Captain America. After he's defrosted... what does he do?" said Manager of Sales Communication Arune Singh. "How does he react to the world?" This is a good con for Captain America fans, to be sure. 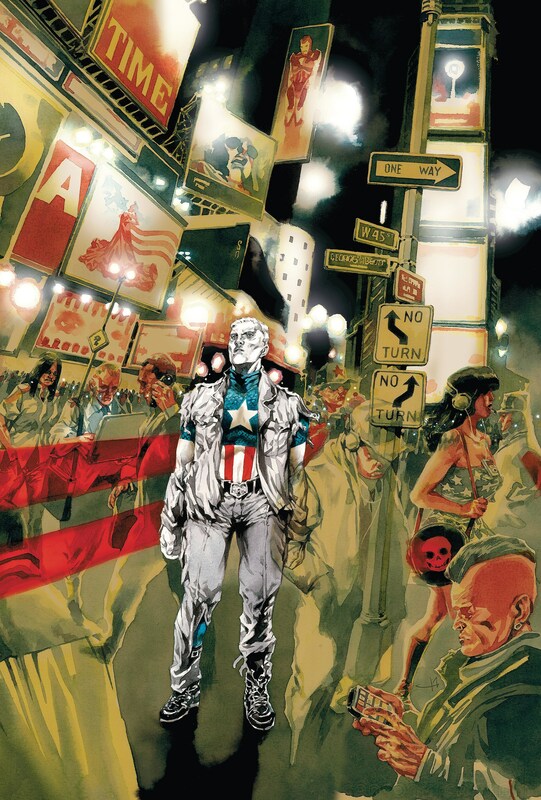 Marvel released several images for "Captain America: The Korvac Saga," a book by Ben McCool retelling a classic Marvel tale, a teaser image for Ed Brubaker's upcoming "Trial of Captain America" arc in the ongoing "Captain America" series, "Captain America: Hail Hydra" by Jonathan Maberry, and "Captain America: Fighting Avenger," by "Atomic Robo" writer Brian Clevinger. The latter series takes place between Captain America getting juiced on Super Soldier Serum and becoming the Living Legend of World War II. If Mark Waid's "Man Out of Time" is the "Year One" for Captain America in the Marvel Universe, Clevinger's book will be the "Year One" for Cap in World War II.